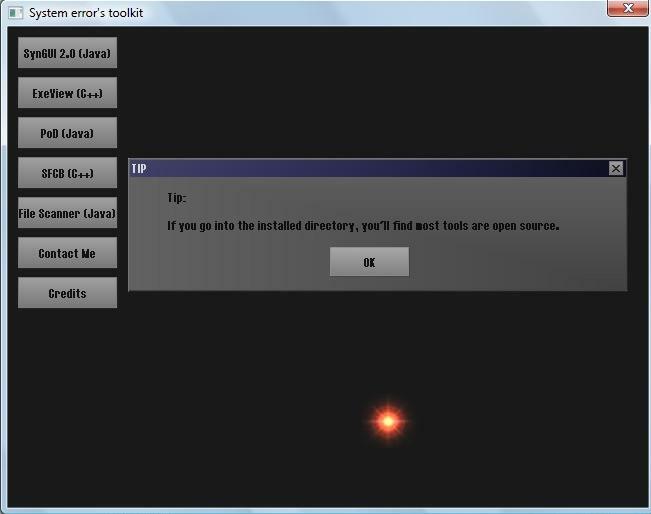 What is System error's security toolkit? Well, some of you may remember me from Hackers Paradise a very popular hacking website with tools, exploits, tutorials and very big community, I created many hacking/security based tool's which was on that site but because I finished my hacking career they was removed. Since I announced that all the sites/forums will be closed I've literally had hundreds of emails asking me to put my tool's back online - I have refused for a long time until now. This toolkit is a collection of my favourite tools (many which i've made open source) along with new ones that hasn't been released to the public until now; this colloection of tools are intergrated in a nice interface along with some cool graphics and audio - but keep in mind that this is for ethical use only as I am now ethical too. This is a modern highly effective denial of service tool, it takes advantage of the fact the most computers have to be open to the public, with that comes open ports, these ports on a host/IP can be flooded with syn packets flooding that specific port with your data blocking legitimate users and thus causing denial of service conditions. the path of the file, and it's extension. The Ping Of Death of (PoD) is probably the most recognized DOS attack, most computers are patched by this (filtering ICMP traffic) but some aren't.., this tool send more than the alowed databytes to a host causing it to crash and sometimes gving them the blue screen of death. This is a tool I started working on but did not finish, it's a syn flood with buffer send - you can finish off what I started with this (but be sure to give me credit) requires C++ knowledge, win32 and WinSocks coding. This tool can scan literally thousands of files on a system in literally seconds, very usefull.